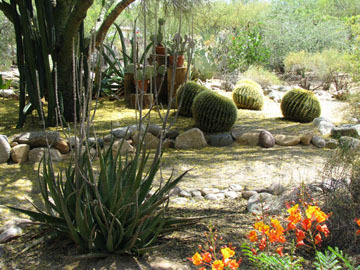 Landscape design and techniques are utilized throughout my .8 acre lot to create wildlife habitats, reintroduce native plants and showcase artwork. 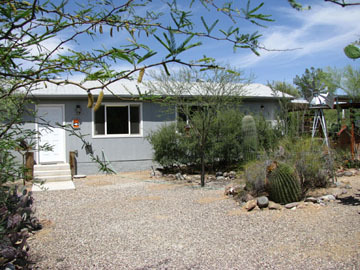 Connected by a network of defined trails, the side and rear yards offer shade, privacy, a nursery and cactus garden, potting shed, ramada and special seating areas. 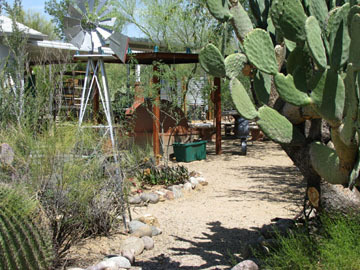 The enclosed back yard, slightly higher in water use, offers flower beds, sculpture gardens, potting areas and desert tortoise habitat. 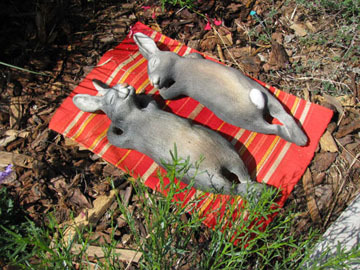 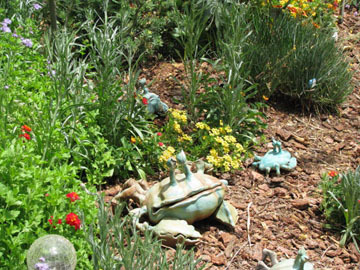 I have tried to create on my property a sense of tranquility, lushness, whimsy, and a deep love of nature. Homeowner vision and hard work (by not just me) are evident throughout.The property is a registered wildlife habitat, and has been featured in both the Tucson Botanical Garden Tour and the Open Days Garden Conservancy Tour. 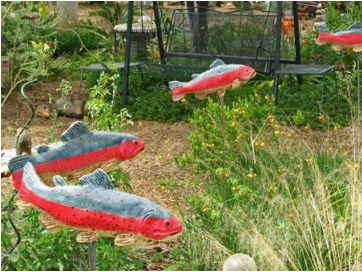 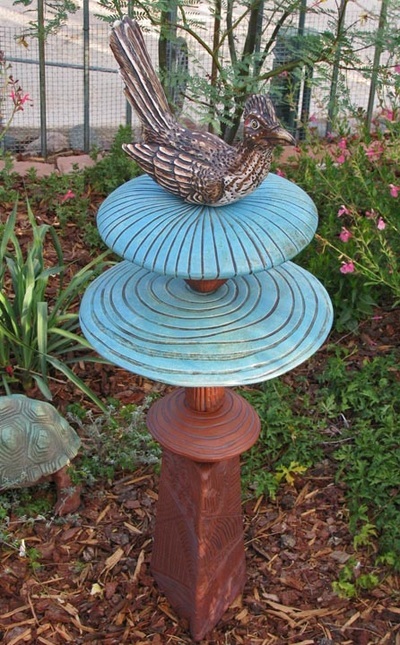 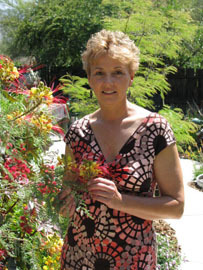 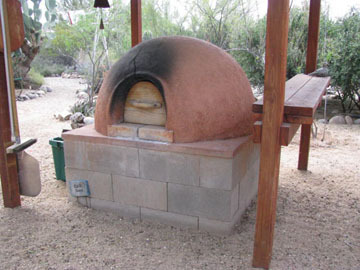 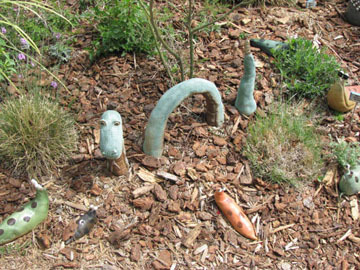 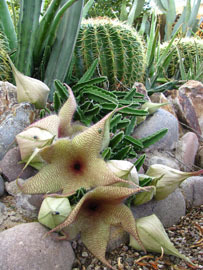 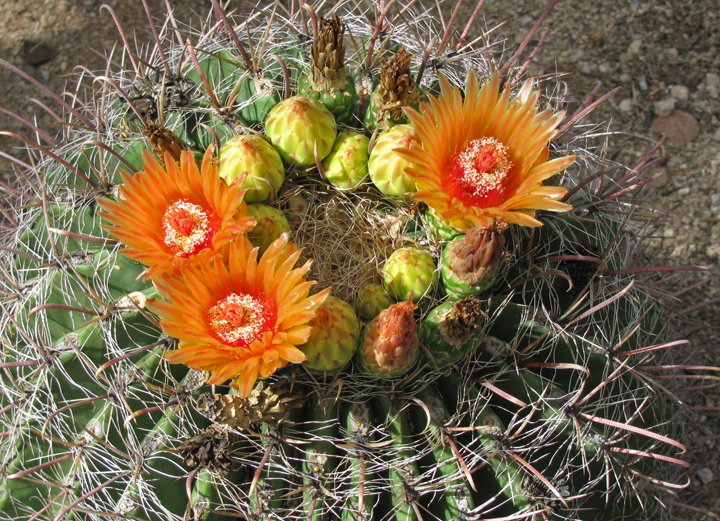 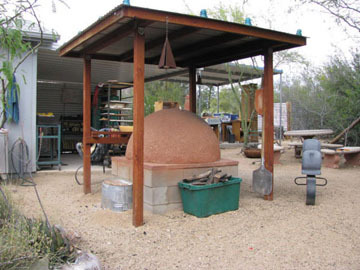 In 2003 it won the Homeowner's Category and Best Design to Attract Wildlife in the Tohono Chul/AZ Department of Water Resources Xeriscape Contest. At my Bi-Annual Art Show, patrons are invited on a self-guided tour around the yards. 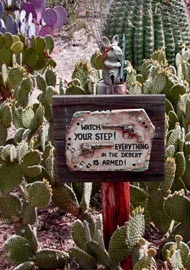 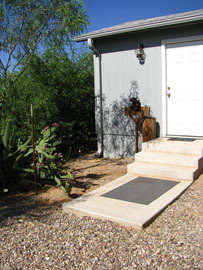 The front, side and rear yards are fully accessible to all the desert creatures we share the area with. 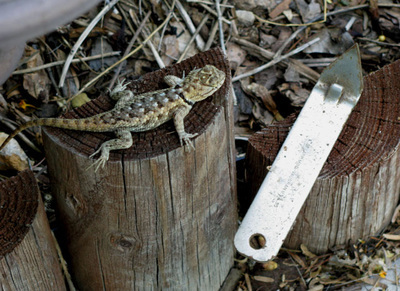 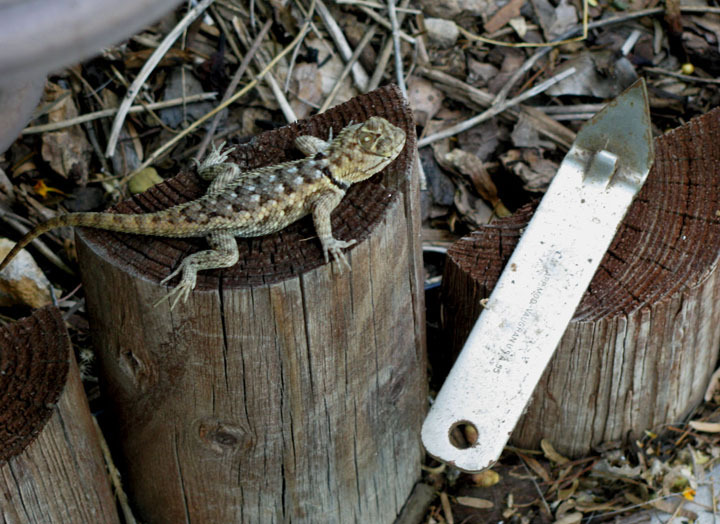 The immediate back yard is enclosed by a wooden fence which keeps out rabbits and javelinas, and provides a safe space for vulnerable plants and our desert tortoises. 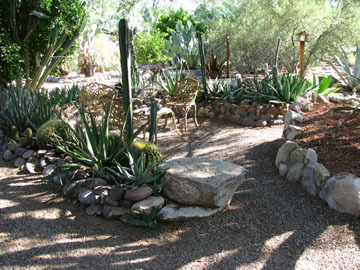 The front yard features a mix of agave, prickly pear, saguaro, mesquite, acacia and palo verdes. 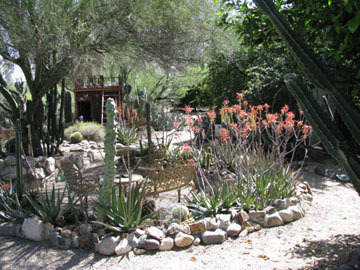 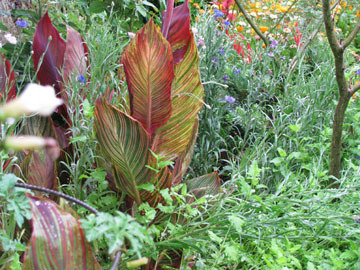 I have brought in accents of sage, Mexican and red bird of paradise, and an assortment of aloes. ​The different yard areas (gardens) are all connected by a network of defined trails developed over a period of time to following the natural flow of water and existing trails the wildlife used. 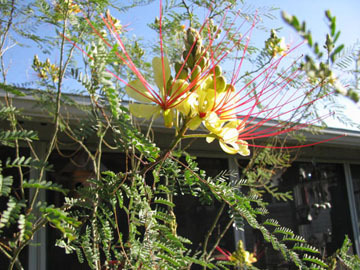 The East trail takes you past the raised vegetable gardens, to more of the native flora of our area. In addition to two small, often threatened citrus trees (they have fruit production issues), we have a new red push pistache, desert museum palo verde, and a desert willow. 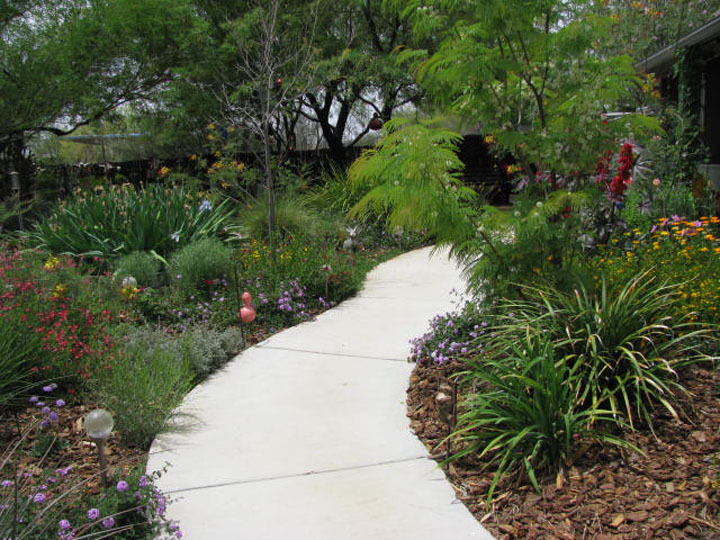 They blend nicely with the mature mesquites, hackberry bushes, blue palo verdes, acacias, etc. 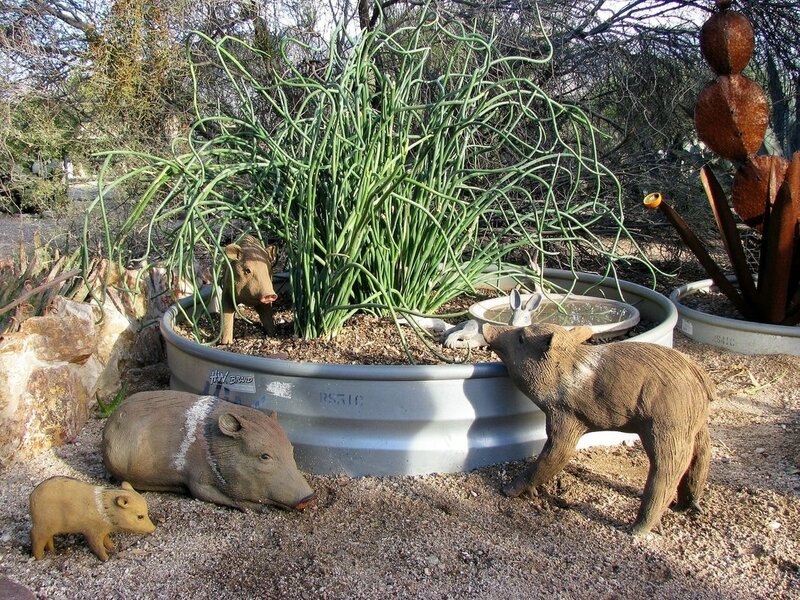 ​Javelina Crossing - My sculptural stoneware javelinas lounge around some shallow tanks that feature additional art including a birdbath "pool". 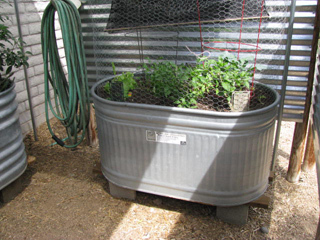 The use of stock tanks gives me that back-home-Wisconsin-farm-girl feeling. 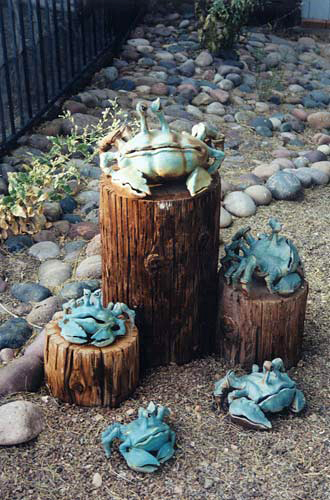 After a trip to the big island of Hawaii, I constructed this 10-foot "offering platform" and Haiau platform in honor of a friend. 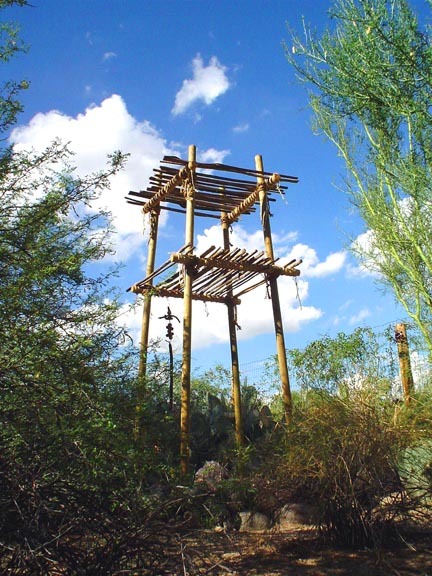 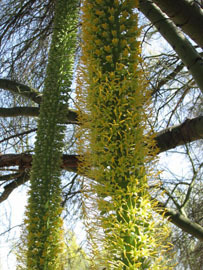 It is a spiritual site using natural materials like saguaro and ocotillo ribs. 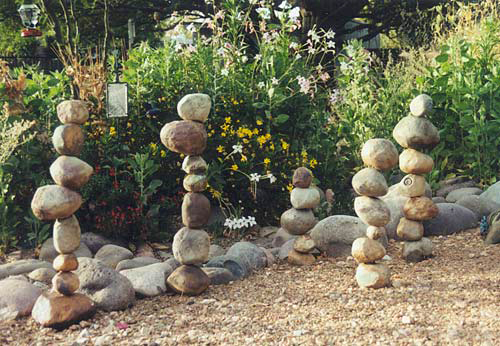 The rocks at the base are pieces from three individual collections. 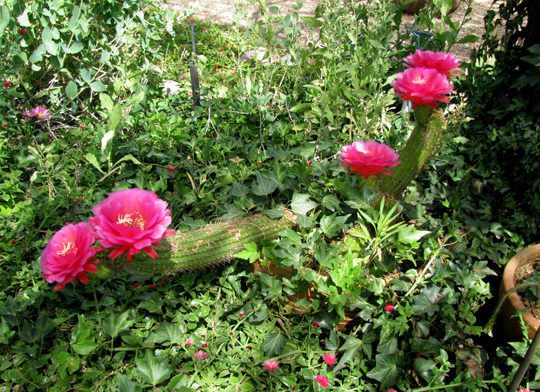 ​The cactus garden has grown lush in the past few years. 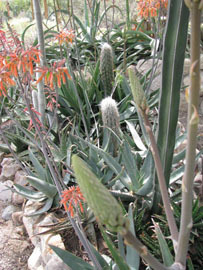 Aloes need to be thinned, Golden barrels are getting huge! 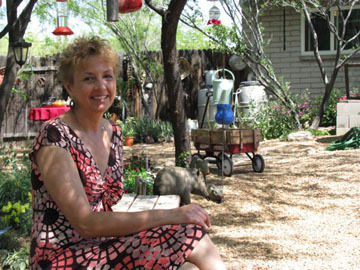 What a peaceful area to sit in, gazing at the mountains from beneath a large Palo Verde tree. 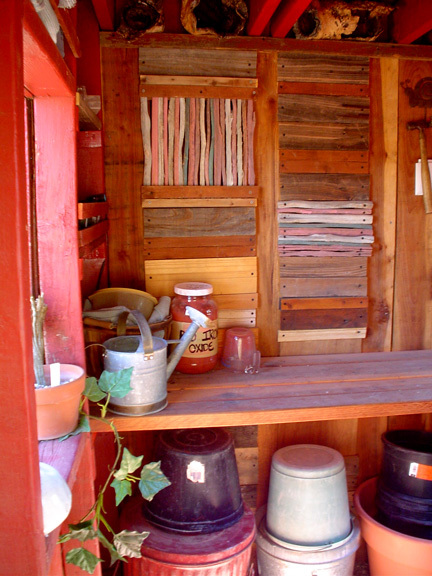 My Yordani Garden Shed (rebuilt from Cathy Yordani's children's old play house) is standing strong. 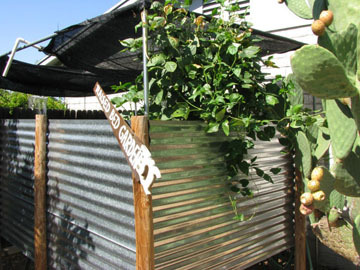 I have added chicken wire to the windows and door to keep out opportunistic pack rats. 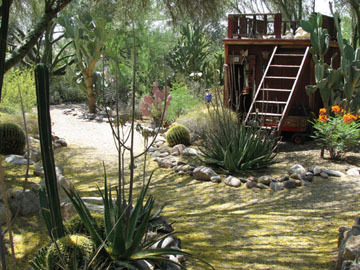 The Southern Yard has gone through many changes. 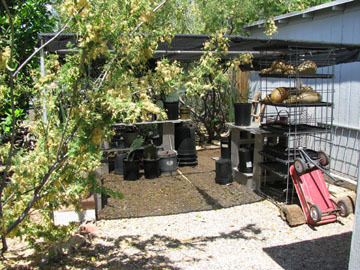 I still have the "Rabbit Ramada", but lost the big Palo Verde tree it was built under. 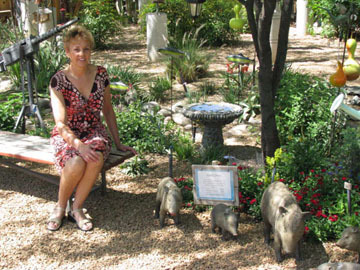 The nursery has been expanded, and the studio has been operational since 2009. 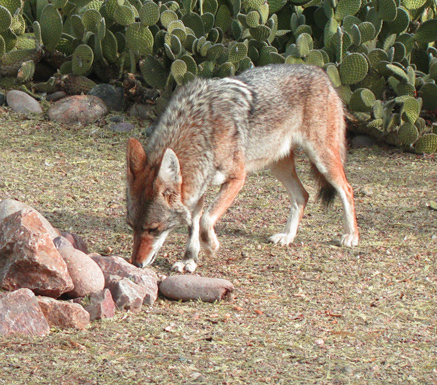 It is wonderful to have a separate work area with a beautiful view of Pusch Ridge in the Catalina Mountains. 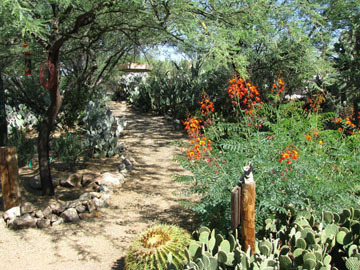 This part of the yard has grapefruit, orange, and lemon trees, as well as a variety of prickly pear cactus species. 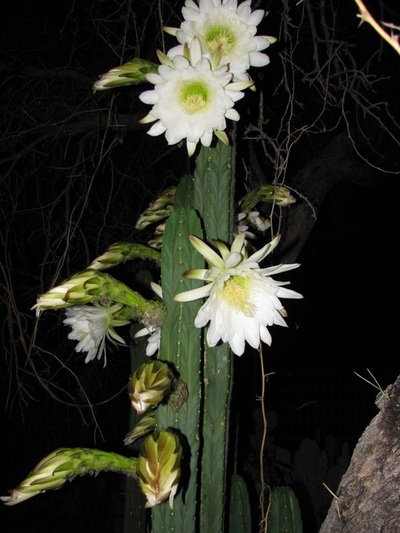 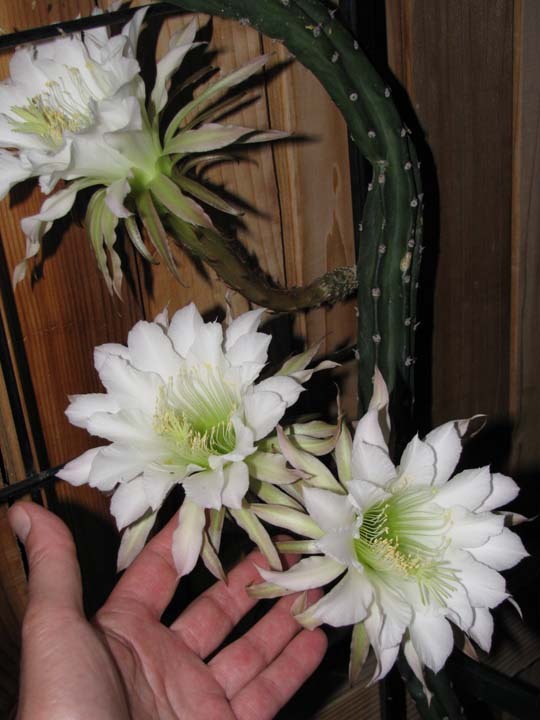 Every few years I harvest and process cactus fruit to add flavor to foods and beverages. 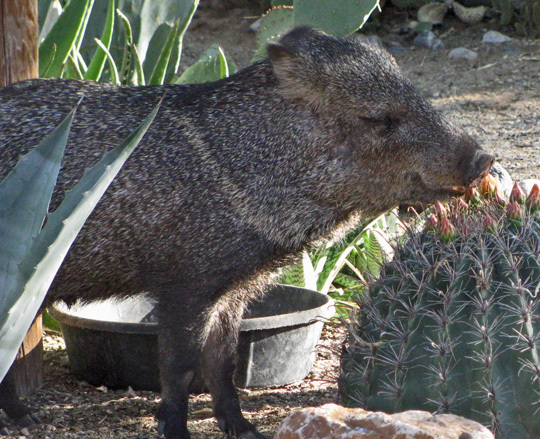 Javelinas like to nap in the cool moist tree well to beat the heat. 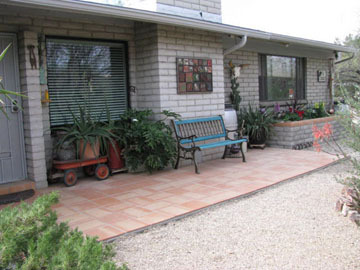 The Enclosed Back Yard has undergone an extensive redesign. 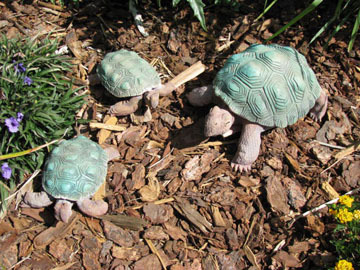 We tore out the grass except for a 6-foot square patch for the desert tortoises, and removed part of the sidewalk. 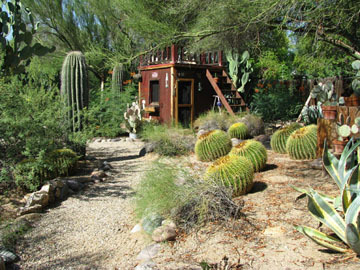 In their place is a new patio area and butterfly/hummingbird/desert tortoise garden. 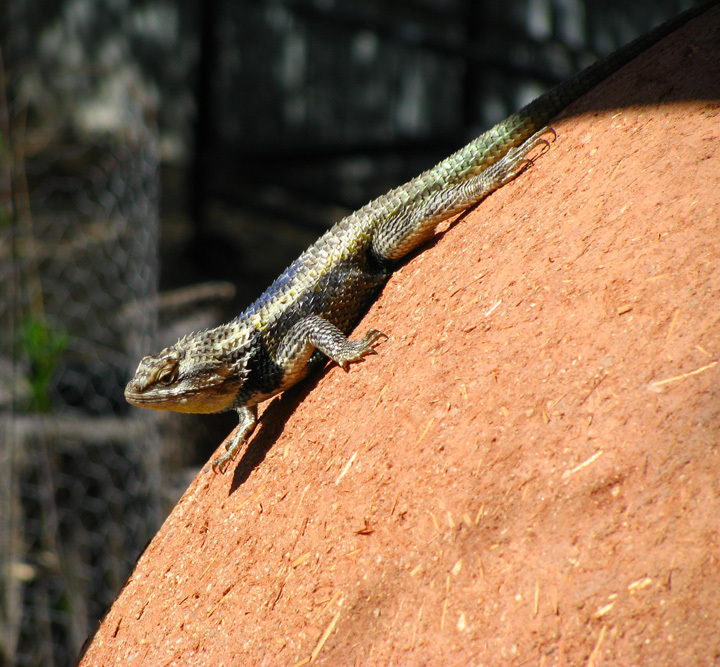 To go along with our rain harvesting barrels at each corner of the house, I bought a 6-foot section of culvert to act as a giant cistern. 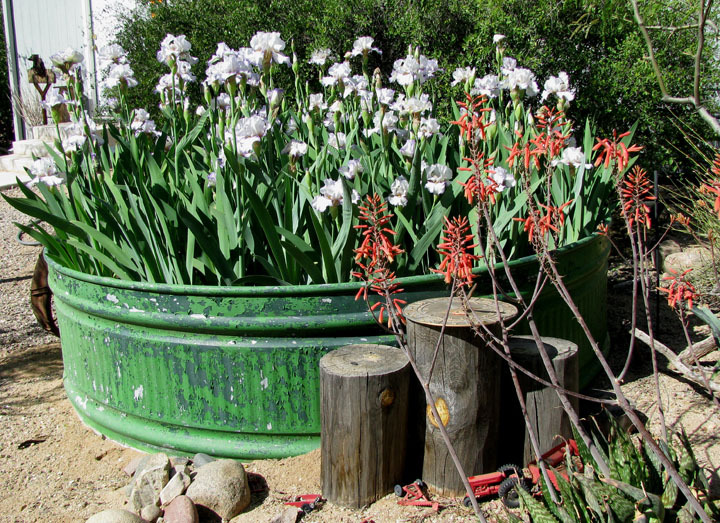 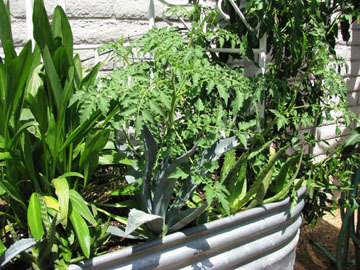 It holds around 300 gallons of precious rainwater. 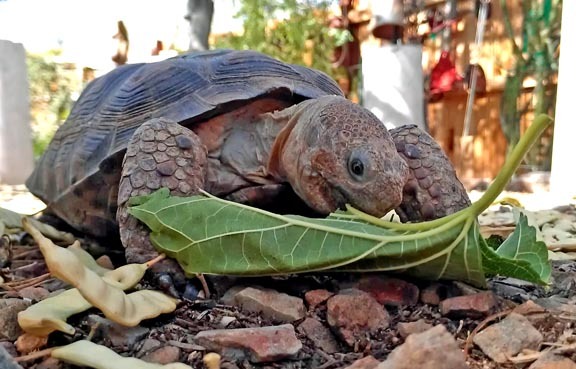 The tortoises, ( desert tortoises and 1 box turtle) love the new design, and the hummers, bees, and butterflies are busier than ever! 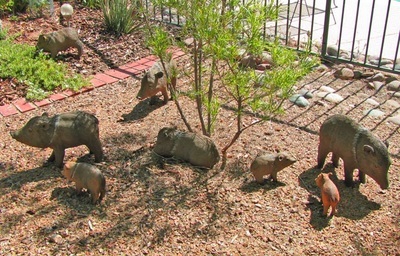 The Torso Sculpture Garden, potting area, and tortoise holding pens are on the west side of the fenced-in yard. 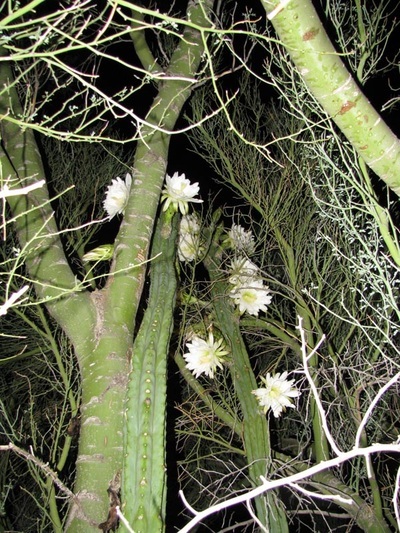 These areas are shaded by mesquite trees and a number of smaller desert willows. 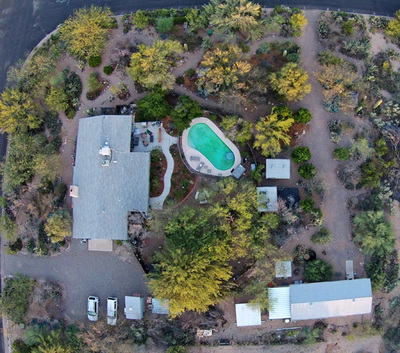 The pool and sidewalk areas on the other side receive full sun from their southern exposure. 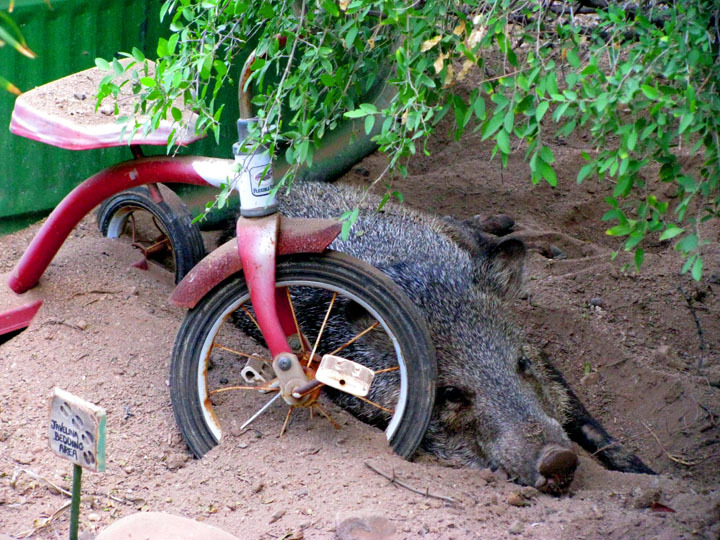 There is never enough shade in Tucson! 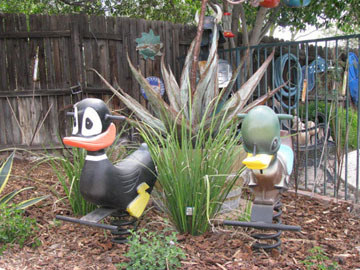 Various art works enliven not only the enclosed yard but the entire acre property!